1. 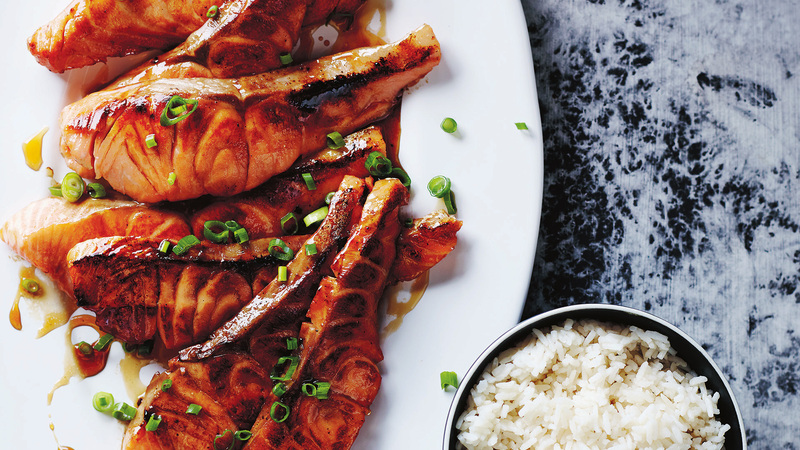 Combine the teriyaki sauce ingredients in a small saucepan and simmer for about 5 minutes. Remove from the heat and leave to cool completely. 2. Once cool, pour half the sauce into a flat-bottomed dish and marinate the salmon slices for about 30 minutes, turning them over once. Return the remaining sauce to the heat and bring to the boil. Simmer until it reduces by about one-third and is a little thicker. 3. When ready to cook, heat the oil in a heavy-based frying pan over medium heat. Add the salmon slices and cook for around 1 ½ minutes on each side. The sugar in the marinade will make the salmon pieces colour quickly, so make sure they don’t burn, and turn down the heat if they are getting dark too quickly. The salmon may look overcooked at this point but trust me, it’s not. It will still have a little blush in the middle. 4. Alternatively, you could cook the salmon slices under a hot grill for 1 ½ minutes on each side or sit them on a piece of baking paper in a steamer basket and cook for 4 minutes. Whichever method you choose, they are delicious. the saucepan. Scatter on the spring onions and serve with rice and Asian greens or a salad.